An aging movie action superhero tries to reinvent himself in a Broadway play. Riggen Thomson (Michael Keaton) is producing, directing and starring in a Broadway show from a Raymond Carver short story ("What We Talk About When We Talk About Love") he has adapted. In his younger days, he made his mark in the movies as "Birdman," but balked at a third sequel. Now he is older, his hair is thinning, his physique is not what it once was, so he hopes to revive his career with a hit Broadway show. However, he is haunted by his alter ego, Birdman, who harangues him about what a failure he is. When one of the actors in his play is hit on the head by a light, Riggen hires Mike Shiner (Edward Norton) to join the other cast members Lesley and Laura, played by Naomi Watts and Andrea Riseborough respectively. (Riseborough came to our attention playing Wallace Simpson in "W.E." ). Mike is an over the top method actor; Lesley is involved with Mike and Andrea is involved with Riggen and thinks she is pregnant. 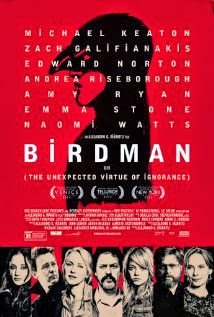 Add to that Riggen's daughter, Sam (Emma Stone), who is just out of rehab and seems to hate him, so perhaps the rigors of a Broadway show are just too much for this aging Birdman. Edward Norton has made a name for himself playing strange characters and his character here is no exception. He has been known to be an intense actor himself. Is he playing a parody of himself? Zach Galafinakos, playing against type as Riggen's serious friend and attorney, Amy Ryan as Riggen's ex-wife and Lindsay Duncan ("Last Passenger," which I reviewed last week) as a vicious theatre critic round out the excellent cast. When this film was first released, there was a great deal of buzz around it. It was polarizing. You would love it or hate it. Well, I am in the "loved it" camp. It's an inside look at the world of theatre while at the same time making a statement about its pretentiousness, how self-absorbed actors can be and the lack of tolerance for movies by "theatre people." It asks what is the nature of celebrity? Who gets to be a critic? What role does social media play in what we think? Sounds deep? It is, but it's also a comedy, though a dark one. This is the latest film from Mexican director Alejandro Gonzalez Inarritu, the same man who brought us "Amores Perros," "21 Grams," "Babel," and "Biutiful," all very serious films, but he flexes his comedy, though dark comedy, muscles with this one. Emmanuel Lubezki (the same guy at the camera helm in "Gravity" and for which he won an Oscar) is the cinematographer and his expertise almost turns the camera into another character, as it leans into conversations and private moments, bringing us right into the action flowing in front and behind the characters in almost one fluid take. The colors and clarity are gorgeous and capture the excitement of New York City. The soundtrack, with original score by Antonio Sanchez, also plays a starring role. Most often it is just percussion, heightening the tension, but then a lovely recognizable classical piece comes along to give the viewer a breather. Michael Keaton is brilliant in his first starring role in six years, and it's not lost on the viewer that he himself played an action superhero, Batman - a Batman some feel was the best incarnation. He captures the angst of a man in midlife crisis, even possibly insanity, in a top notch performance that will no doubt earn him an Oscar nomination. He is not afraid to let us see his receding hairline and wrinkles. Norton as well puts in another stellar performance and should get an Oscar nomination for Best Supporting Actor. I also wouldn't be surprised if director, cinematographer and score are also given nods. This is a thinking person's film. You might have to see it more than once to get all of the nuances. Rosy the Reviewer says...One of the best of the year! Before getting married, a young writer travels back to meet up with old girlfriends. 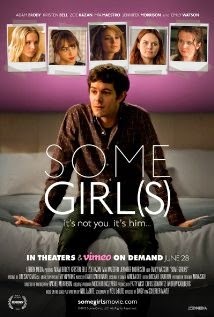 A thirty-something professor and writer (Adam Brody) known simply as "Man," meets with five ex-girlfriends to find out what they think of him now and to justify his past behavior. He travels to his hometown of Seattle to meet with Sam (Jennifer Morrison), who was his high school sweetheart and who is still angry that he didn't take her to prom. Then he's off to Chicago to see Tyler (Mia Maestro), a wild child whose expectations of him were small. Then he's on to Boston to see Lindsay (Emily Watson), an older married woman who was one of his college colleagues. Back in Seattle once again, he meets with Reggie (Zoe Kazan, granddaughter of legendary director Elia Kazan) who was the younger, much younger, sister of one of his friends (and there are unsettling hints at what went on between them when she was just 11), and finally Bobbi (Kristen Bell) who appears to be the one who got away and who Man still loves. All of his meetings with the women take place in upscale hotel rooms creating a claustrophobic atmosphere. Though he seeks redemption, how each woman remembers the relationship is wildly different from how he remembers it and as time goes by, what starts as him seeking forgiveness ends up showing how narcissistic he really is. Based on a play by Neil LaBute, who captures the male sensibility so well and who also wrote "In The Company of Men," each encounter is a little dramatic, and sometimes comic, scene of its own and the cast delivers wonderful performances. However, the dialogue and two-handers smack of watching a play rather than creating a satisfying cinematic experience. Rosy the Reviewer says...Very talky and Man is such an idiotic cad, it's annoying and detracts from the excellent acting. You decide. Two former brothers-in-law of a certain age take a road trip around Iceland. Mitch (Earl Lynn Nelson) and Colin (Paul Eenhoorn) were brothers-in-law (their wives were sisters). They had lost touch but Mitch's wife has just died and Colin is divorced, so Mitch proposes this trip as a way for the two of them to get "their groove back" and get over their troubles: Mitch's "grief" over his wife's death and Colin's grief over his alimony payments. It's a buddy film with a twist. These buddies are in their seventies. Mitch is a gregarious, know-it-all, dirty old man type who makes raunchy inappropriate comments. Colin is quieter and more thoughtful and therein lies the humor and the pathos that we are witness to as these men in the Golden Years of their lives decide to continue to live life to the fullest. Nothing much happens as the two retirees traverse Iceland in a Hummer, but the scenery is breathtaking and the conversation between the two men is bawdy and entertaining. 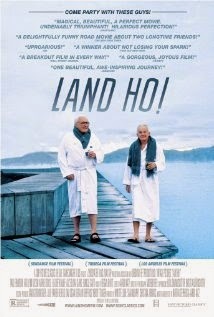 I was most interested in this, film because I have been to Iceland and not many movies are set there. It's always fun to watch a movie in a locale you are familiar with so you can say, "Oh, look, they are in the Blue Lagoon," or, "Hey, isn't that the restaurant we ate at?" But this film is not about the destination. It's a road trip movie about the journey and these two guys are each charming in their own way - Colin hitting on the young backpackers they hook up with (one is Mitch's younger second cousin); A tender moment between Mitch and a Canadian traveler they meet. But mostly Mitch and Colin go to art galleries, smoke pot, get lost in the dark, and dance on the beach. This indie film written and directed by Aaron Katz and Martha Stephens, seems improvised which gives it an almost documentary feel and the characters are slowly revealed through their conversations. Nelson is fairly new to the acting game, but he pulls out all of the stops here, and Eenhoorn is a veteran actor whose subtle responses to Nelson give just the right counterpoint. We get a glimpse of what it's like to be in your seventies and facing what's next, but only a glimpse. There is not a lot of depth here. But that's OK. It's a character driven piece and we are along for the ride. Rosy the Reviewer says...This is a geriatric road trip that is fun for Colin and Mitch and for us as well. A married couple seeking counseling are sent to a retreat where they literally meet their better selves. 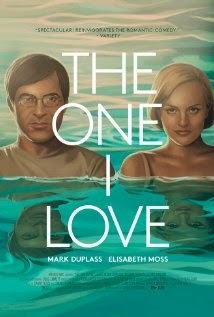 Elizabeth Moss and Mark Duplass star as Sophie and Ethan, a couple who are trying to get their marriage back on track. They go to a therapist (a very creepy Ted Danson), and he sends them to a beautiful retreat with a lovely main house and guesthouse to "reset." However, they discover that when they go in the guesthouse, they are not alone. They are met by dopplegangers of themselves, their better selves. When each of them enters the guesthouse, each has an experience of how they wish the other would be. However, Sophie is drawn to the "new" Ethan and doesn't want to leave. There are many unanswered questions such as what forces are at work here, but it doesn't really matter because this is a fun, engrossing two-hander with Moss and Duplass playing both versions of Ethan and Sophie. I can't tell you how many DVDs I have watched and reviewed in the last year about doppelgangers. Well, actually I can. This is the fourth one. We had "The Double," "Enemy," "Face of Love," and now this. It's an interesting device but at this point, it's getting a bit old. But Elizabeth Moss is wonderful here . She made her mark in "Madmen," but I have loved her ever since seeing her in "Top of the Lake" for which she won an Emmy (and if you haven't seen it, do). Rosy the Reviewer says...it's "Couples Therapy" meets "Twilight Zone." If that sounds like fun to you, you will like this film. It does to me and I loved this film. A young priest in 19th century Russia must spend three nights alone in a church praying for a young woman who he believes is a witch in this story by Nikolai Gogol. This Russian adaptation of the Gogol short story stood as the only Russian "horror film" for many years. 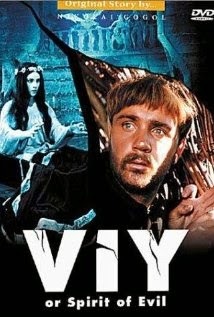 Why It's a Must See: "...Viy is a colorful, entertaining and genuinely frightening film of demons and witchcraft that boasts some remarkable special effects...the film truly amazes, as nightmarish creatures from beyond begin a parade across the screen. They culminate with the appearance of the demon Viy, ,who, in the words of one reviewer, 'makes his entrance against a backdrop of one of the finest collections of ghoullies, ghosties, and long-leggity beasties' ever to appear in the movies." Sorry, even by 1967 standards, this was not at all "genuinely frightening," nor were the special effects "remarkable" nor did the film truly amaze. In fact, the special effects looked like they could be from a movie filmed in the 1920's. And Viy looked more like Jaba the Hut than anything scary and all of those ghoullies, ghosties and long-leggity beasties forming the finest collection? It was done better in "Freaks" in 1932. I found it all quite laughable and wasn't sure whether I was watching a comedy or not. I don't think it was supposed to be a comedy. This three-hour epic tells the story of Radha, a woman who must overcome poverty and many obstacles to raise her sons. Radha, played by Nargis, a beautiful Indian superstar, loses her husband and her land and must make a life for herself and her sons. Despite many trials and tribulations, she never lets down her moral code, even when it comes to one of her sons. The film follows Radha from her marriage into old age. 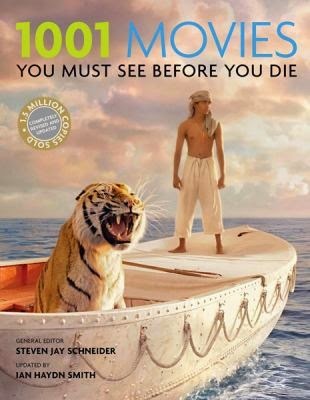 This film predates what we think of as Bollywood movies these days. I love Bollywood films. It doesn't include the Bollywood dancing we have come to expect, but it has many songs scaled to Western tastes. Despite some very overdramatic bug-eyed acting at times, this film is mesmerizing and Nargis is a gorgeous and sensitive actress. 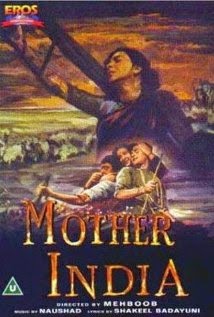 Why it's a Must See: "...one of the few Indian films ever nominated for an Oscar...India's Gone With the Wind...one of the few films that can still draw audiences to theaters whenever it is screened. It is the first Indian movie to which anyone with an interest in world cinema should turn." Rosy the Reviewer says...I loved "Gone with the Wind" and I loved this. 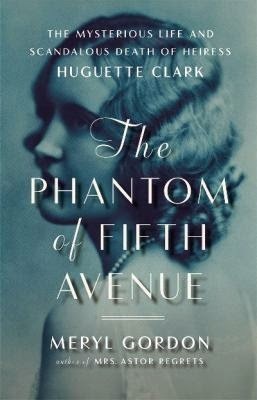 Huguette Clark was one of the richest women in the United States and lived to be over 100, yet she lived as a recluse for much of her life and in a hospital room for the last 10 - and she wasn't sick. Huguette's father was William Andrews Clark, a copper mine magnate, the second richest man in America in the early 20th century. Clark was not a very nice man and bribed his way into the Senate. Huguette was worth over $50 million in her early 20's. She married once to a Princeton man and that marriage lasted only two years. A couple of failed romances followed and Huguette started to withdraw. She collected dolls and relied upon just a few hangers on until she withdrew completely into a hospital room. Rosy the Reviewer says...if you enjoy books about the very rich, you might enjoy this, but don't expect the riddle of why Huguette ended up as she did to be solved. This book doesn't do it. I don't like walking dogs. I am a terrible dog owner (more at the end of the month when I realize once again, I will never change).